Caledonia Haulers has grown from hauling canned milk to dozens of food grade products including dairy products, eggs, juices, water, sweeteners, vegetable and soy oils, yeast, water, liquid smoke, and enzymes. We haul to all 48 states and Canada and have trucks in Florida, New Jersey, and California weekly. We have gone from traveling approximately 19,000 miles a year to over 22 million miles a year. 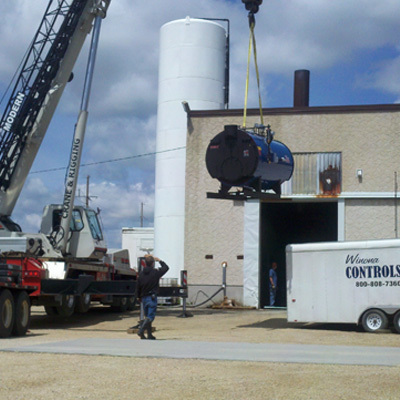 With continued growth, in 2012 our company added a small Midwest terminal in Cedar Rapids, IA. It has 2 full time mechanics and 2 dispatchers as of 2017. When we started in 1958 our routes averaged 50 miles a day and consisted of 90 cans of milk from 20 different farms. With so much to look forward to in the future, we’d love for you to take a step back and look at our past. 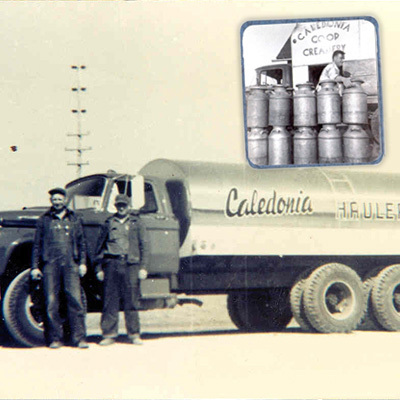 Caledonia Haulers, Inc. was formed for the purpose of hauling milk from the farmers to the Land O’ Lakes plant in Caledonia. The original six shareholders were Joseph Gavin, President; Glen Derr, Secretary; Eugene Kohlmeyer, Vice-President; Hugo Muenkel, Director; John Schmitz, Director; and Walter Schuttemeier, Treasurer. 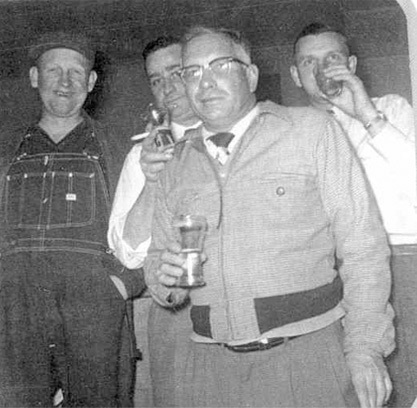 These six men invested $200.00 each and acquired a loan from Sprague National Bank for $10,000 to purchase one milk tank and a 1958 International truck which was driven by John Schmitz. In the beginning, our routes consisted of 90 cans of milk which they loaded on a straight truck at 20 different farms and traveling an average of 50 miles a day to get milk hauled into the Land O’ Lakes plant in Caledonia. These men picked up milk cans in Caledonia, Eitzen, Hokah, Spring Grove, Nodine and Decorah, Iowa. 1960 – We purchased the Spring Grove milk route and a Chevy truck from Orville Flatten. 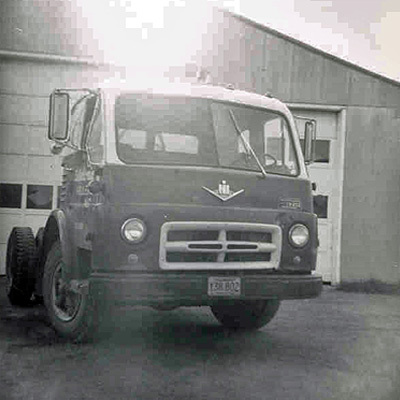 February 4, 1962 – We bought a new Ford truck and a Ford tandem truck to haul milk from Mabel to Caledonia and from Caledonia to Whitehall, Wisconsin. May of 1964 – Lawrence Demmer, Leslie Heintz, and William Koch bought into the corporation. Caledonia Haulers purchased the William Jahn truck line that included an International semi tractor, livestock trailer, feed trailer, and the rights for hauling. We hauled livestock from Caledonia to South St. Paul for the Armor Company. We also hauled products for Caledonia Implement, Brady Elevator, and Hormel. 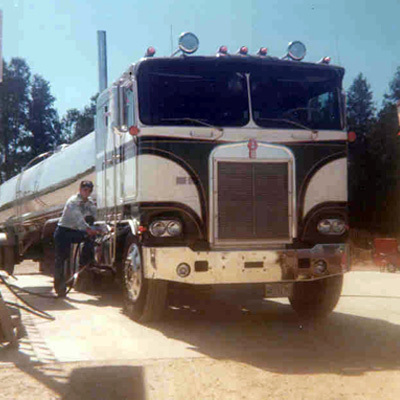 January 6, 1965 – Bought Leslie Heintz’s shares and purchased a new Ford semi tractor and a used tank trailer for the milk route to Illinois, which is still in operation today. 1969 – We bought our second livestock trailer and hired Dennis Hanson to drive for them at a rate of seven cents a mile. 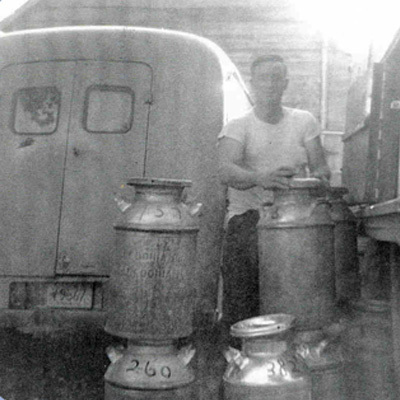 1970 – We bought out Hugo Muenkel’s shares and purchased another milk route in the area around Decorah, Iowa. 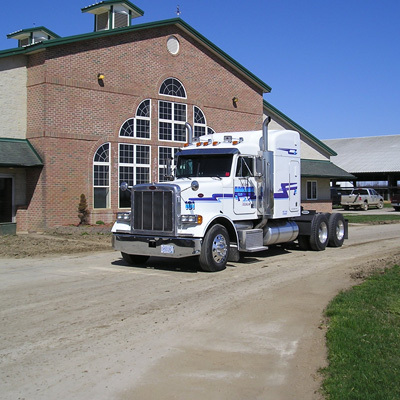 1972 – We purchased the Frank Schmitt’s business which included a livestock truck. Later on in the year, we bought a new livestock trailer and also started hauling milk to Des Moines, Iowa. 1973 – The corporation bought back Eugene Kohlmeyer’s shares. 1977 – The fleet had grown to five tractors and they began to transport milk to Carlinville, Illinois. We leased on two owner operators and bought our first new Walker tank trailer. Walt Schuttemeier retired in 1980. William Koch is still driving today. Joe Gavin continued to act as President of the company until 1992. 1982 – We started a customer repair service for other truck owners which has rapidly enlarged their service department. 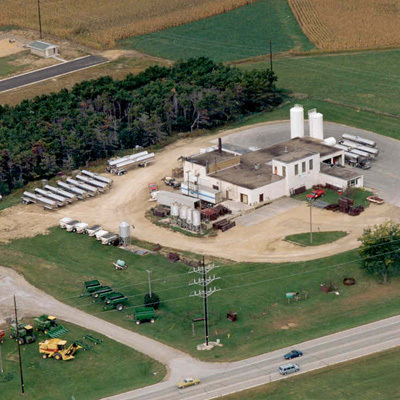 1984 – We began taking back hauls of corn sweetener from Keokuk, Iowa to Minnesota and other points to the North. 1992 – Upon the death of President Joseph Gavin, his son Dennis assumed the responsibilities of running the company. Caledonia Haulers added a new office and parts building to accommodate their growing needs and to better serve their customers. May of 1994 – Dennis Gavin was voted in as President/CEO of the corporation, a position he still holds today. July 1, 1994 – We bought our first computer. Up until this time, everything was done by hand. 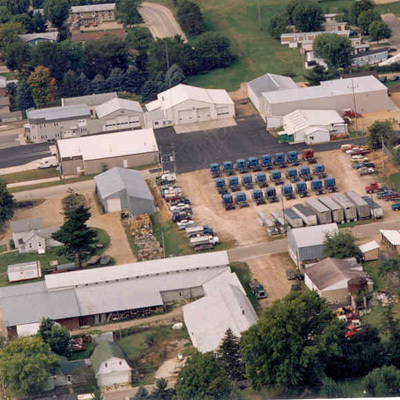 1996 – We purchased the reload station plus six acres of land that was previously owned and operated by Land O’ Lakes. 1997 – We again started hiring Owner Operators. September 15, 1997 – We bought the Erdmann farm route and added another two tractors and four trailers to the company fleet. As of 1997, there are only two shareholders remaining, Dennis Gavin, President/CEO and William Koch, Vice-President. June 3, 1998 – After driving for the company for 23 years, Harold Heaney, Sr. retired. Harold was the second over the road driver to retire from the company. Donnie Rask was the first driver to retire. July 13, 1998 – We bought the Gary Nation farm route and sold the livestock trailers. 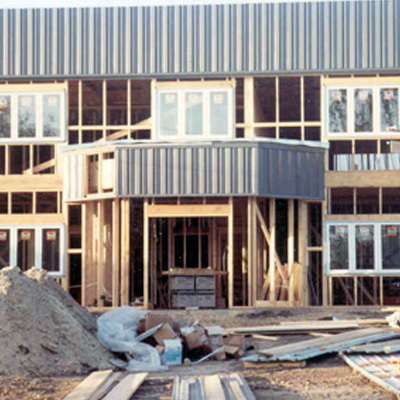 With the growing number of trucks, we built another building to be used as more shop area and we started using this building in October of 1998. December 1, 1998 – The company bought the Wittenberg milk route in Rollingstone which included four quad axle trucks and four drivers. We added another nine tractors and seven trailers to the fleet. 1999 – The company black topped half of the yard and bought another 19 tractors and six trailers. We developed the 10 Years of service and the three-year Safety Plaque Programs. March of 1999 – Gerald Myhre was nominated by the Minnesota Trucking Association for the Driver of the Year in the State of Minnesota. Gerald was selected as the March Driver of the Month in the state of Minnesota. 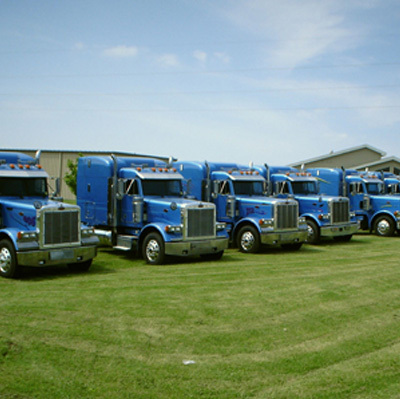 2002 – Expanding the fleet in 2002, we purchased 28 Peterbilt trucks, including six aerodynamic Model 387’s. 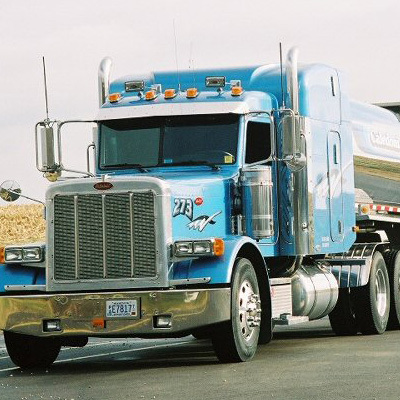 May of 2003 – Maintenance department purchased a new Internet based software system through Peterbilt TruckCare Connect to track inventory, customers, equipment, and work orders. This was a huge step forward which improved their ability to track histories and preventative maintenance and now allows them to analyze data faster. August of 2003 – Purchased the truck division of Terry Johnson and Sons, in Darlington, WI. One dispatcher and about 20 trucks are in this location. We rent some property and outsource basic equipment maintenance. 2004 – Moving with emission standards, we ordered 26 trucks with Caterpillar Acert technology and another 29 trailers. 2005 – By the end of 2005 almost half of the fleet was running the new lower emission CAT engine. The new technology brought on some new challenges to shop personal which prompted some updating of diagnostic tools. We now rely more on the Internet for information and laptop operated programs. 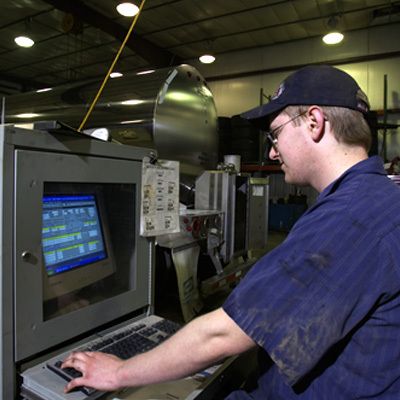 Our maintenance department has grown along with the fleet over 24 years and as of 2005, they service and sell parts to almost 100 customers in addition to our own fleet. 2006 – By the end of 2006, the company had added three trucks and farm route trailers to the Northwest Indiana area and was operating 100% CAT power in Peterbilt chassis. This closely developed relationship with Peterbilt has earned them a distinguished reputation that was featured in the “First Class” Magazine summer issue. 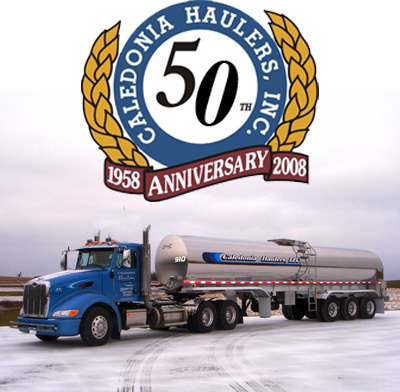 October of 2008 – Caledonia Haulers celebrates their 50th Anniversary. 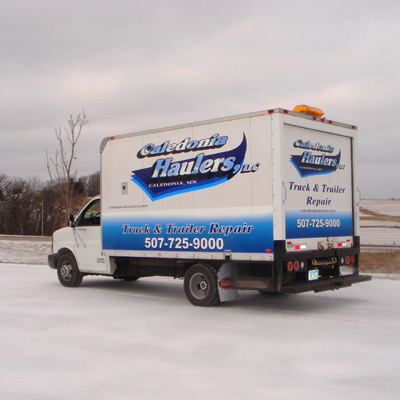 April of 2010 – Another growth year for Caledonia Haulers. 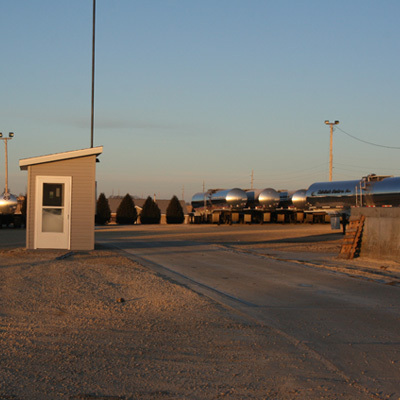 We acquired the Jerry Sommer’s milk route in the Waukon, Iowa area and began a facelift to our main offices. Then with continued changes of federal emission standards Caledonia Haulers was forced to make a change in engine manufacturers. To further strengthen the relationship with our Peterbilt dealership, we cautiously made the change to the PACCAR brand MX engine. May of 2011 – Persistent growth and expansion continued with the update of our payroll offices and the purchase of several trucks and trailers from Rembrandt Enterprises. Realizing an update was needed for efficiency, our owners made the decision to purchase and install a new scale at the milk receiving location to end the year. June – August of 2012 – Continued updates of the milk receiving plant by installing a new boiler system and blacktopping the entire parking lot. September of 2012 – Needing to expand their presence in Cedar Rapids, IA. Caledonia Haulers leases a new location; adding one mechanic and one dispatcher. 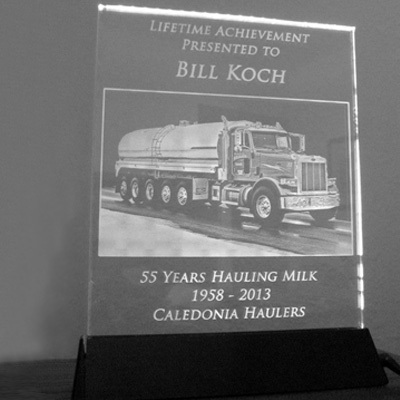 February of 2013 – Owner Bill Koch retired after 55 years of hauling milk and was presented with a lifetime achievement award. Bill also sold his shares to Dennis leaving Dennis J Gavin as the sole owner. 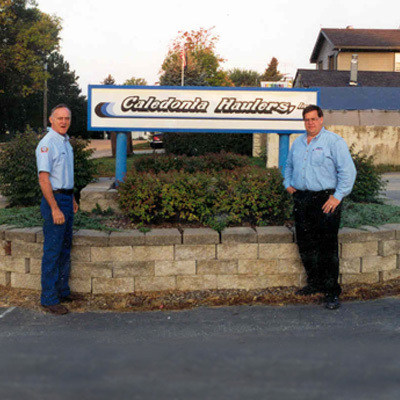 October of 2013 – Caledonia Haulers celebrates their 55th year! September of 2014 – Construction begins for consolidated and greatly improved maintenance facility. February of 2015 – The new shop construction was completed and staff moved in. 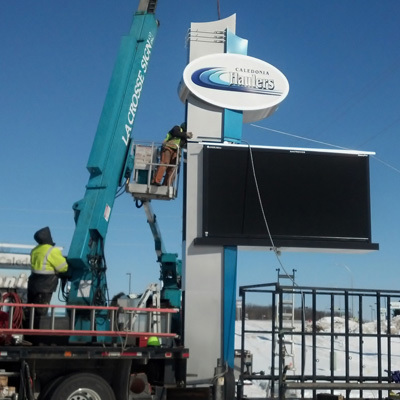 March of 2015 – Installed new LED message display for company and community announcements. April of 2015 – Caledonia Haulers agrees to take on large AMPI project, adding over 40 farms to the milk routes. May of 2015 – MPCA (Minnesota Pollution Control Agency) awards Caledonia Haulers a 2015 DERA clean diesel grant! September of 2015 – May and September we seen growth on the milk route side resulting in 46 additional milk patron stops. March of 2016 – Started Testing 2 New 2017 emission engines for PACCAR. 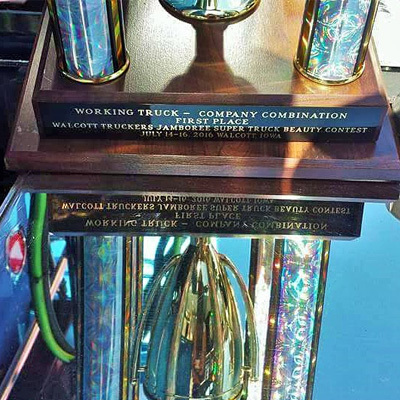 July of 2016 – Driver Mike VanNess Wins 1st Place Working truck-company combination at Walcott Super Truck Beauty Contest. September of 2016 – Completed new Dispatch Operations center. January of 2017 – Purchased Mayer Milk Hauling Route adding 49 new milk patron stops bringing the total growth on the route side to 59 new patrons for 2017. 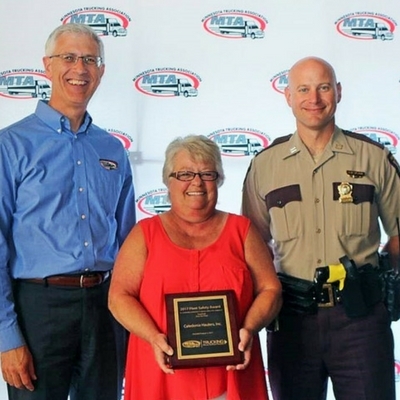 August of 2017 – MTA winner for Accident Free Safe Driving in Tank / Bulk Over the Road category. 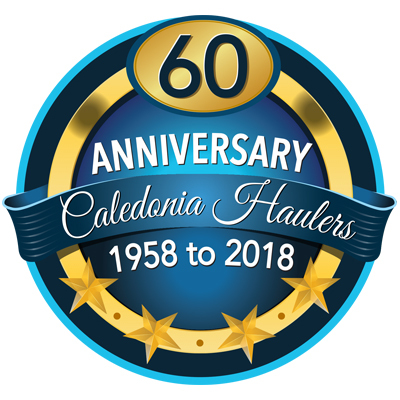 October of 2018 – Caledonia Haulers celebrates 60 years in business. In 2017 Caledonia Haulers hauled 32,309 loads. That’s an average of 621 loads per week!